Previous Post: Perfectly Pinnable: Inspire a Soap Queen Tutorial! Would this recipe turn out the same if I leave the fragrance out? My moms allergies are horrific when it comes to scents. Can essential oils be used instead of fragrance oils in this scrub? Hi, I can’t wait to try this recipe however I’m from the uk and struggling trying to convert this recipe to grams and ml. (confused face!) Is this recipe by weight or volume? Thanks for any help! This recipe is measured by weight! We measure most of our recipes by weight, as we feel that’s more accurate. An easy way to convert to grams is to use a search engine, like Google. You can type in “6 ounces in grams.” That gives you 170 grams. Hello! If you wanted to, how could you turn a scrub like this into a face-safe scrub, with jojoba beads? I love a lot of your scrub recipes and I was wondering how I could translate them into a full-body-safe scrub? Like this one or your rose clay sugar scrub or the sweet summer scrub? Fragrance oil is another thing to take into consideration. While a strongly-scented scrub is fine for your body and hands, it can be a bit overwhelming on your face – and right next to your nose! For this scrub, you may want to add a little bit less fragrance oil. How many ml jar would this fill? Im about to make this scrub but I have no other preservative than vitamin E. Is it ok to use that and what amount do you recommend? Also, if decided to not use any preservatives, how long will it last? While vitamin E oil can extend the shelf life of fixed oils, it is not considered a preservative because it has no antimicrobial properties. Preservatives are typically used in recipes that contain water. While scrubs don’t contain water, they can have some splashed into them and potentially grow mold. I’ll include a link to a great blog post about that. I would like to make this scrub with grapefruit essential oil in place of the fragrance oil. Would that work? And how much should I put in? I’m thinking 8 ml because that’s how much fragrance oil was added, but essential oil may be different. Thanks! You can definitely use essential oil instead of fragrance oil. For this recipe, you can add 8 mL Grapefruit Essential Oil. If you want a more bubbly scrub, you may like one made with Potassium Cocoate. It behaves similarly to liquid soap. 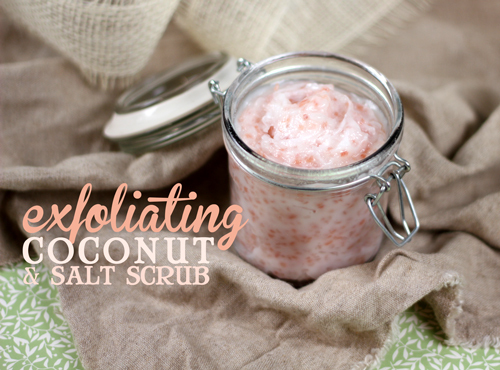 We have an awesome scrub recipe that uses Potassium Cocoate that I’ll paste here! ONE: In a microwave-safe container, melt down the Avocado Butter on 30 second bursts. Once fully melted, add the Potassium Cocoate and stir. TWO: Add the sugar and stir to fully incorporate it with the liquid oils. THREE: Add the Cucumber & Kiwi Fragrance Oil and Optiphen ND and stir well. FOUR: Add the Forest Green Jojoba Beads and stir. Immediately scoop scrub into your packaging. Your sugar scrub is ready to use! Hi, it looks pretty) what does “6 oz” mean? Hello I am extremely new to making my own scrub (as in I JUST now ordered everything to make this scrub as a Christmas gift for my sisters and mother this year). I read through all the comments here and I am a little confused on somethings. I read that this recipe will fill about 1 and a half of the little jars but the video shows it barely fills one jar. And also I have a question. How long will this scrub “keep”? I’m not sure how long it would take for my gift receivers to use the entire jar I give them and I dont want it to go bad. I also purchased the preservative from your company and I said in one of the comments that the measurement would be to use .5-1% or 3.7 grams of the preservative. Does that mean use 3.7 grams of the preservative for each batch like it is made in the video? Sorry for the long post and the many questions. Because this scrub does not contain water, technically you do not need to use a preservative. But, if this product is going to be stored in a place where it may come in contact with water (like the shower) many people like to add one to be safe. You may find these blog posts about how and when to use preservatives helpful 🙂 When adding a preservative, you use them at a usage rate of .5-1% of your total recipe. Should add when reheating don’t do it for very long. I would say just til it’s soft but not liquidity. Coconut oil and essential oils lose their mojo for lack of a better term when being heated at high temps. As you know coconut oil melts at 76°degrees. Always keep it in a mild temp place. Don’t want it hard or a runny mush. When using coconut oil get the extra virgin unrefined/cold pressed pure coconut oil. The oils should not completely solidify. I would suggest placing this in the refrigerator to harden up some. The coconut oil in the recipe should firm up once cooled down. Then after a few hours it separated 🙁 how do I keep this from happening? I really want to try this, but I never have fractionated coconut oil. Is there another oil I can sub for it? The reason for adding Fractionated Coconut Oil is that it is not solid at room temperature, and gives this scrub a creamier, more liquid texture than regular coconut oil would alone. If you wanted, you could use Coconut Oil by itself. Just keep in mind that the texture will be harder, but would still melt when used in the shower, or when rubbed on the skin. If you’d like to swap it out for another oil that results in a more liquid temperature, you have a lot of great options! You could use Avocado Oil or Jojoba Oil because they are both skin loving oils that are liquid at room temperature. I hope this helps April! You are the best. I think I watched it 4 times and never noticed it. We are making this as teacher valentines! We also bought stuff to make heart shaped bath fuzzies (used the star recipe that you offered-saw the recipe on that video! HaHa!). We put “You make me all fuzzy inside. Be my Valentine”. In my defense, I went back to watch for 5th time. Never noticed but I have a bar that appears on the bottom that perfectly covered the measurements, after looking closely I can now see them under the bar. I just need to figure out how to get rid of it (the bar). Thank you for the written recipe so I can start making it!! Oh I totally understand :). So glad you were able to see them, I’m excited for you to try this scrub out, it’s a favorite of mine! Hiya, I was wondering, in this scrub (as well as any other homemade scrub or bath salts) is it possible to use a few drops/sprays of perfume to provide the scent? I am just wondering as I thin this would make it easier to have a larger variety of scents and you can personalise it to a favourite perfume, yet I’m not sure if it would actually be okay to use or if it would cause problems or anything. We do not recommend using your perfume to fragrance your beauty products, including scrubs or bath salts. All commercially available “fragrances” are actually fragrance oils with fillers. Perfumes are made with a large amount of alcohol which may affect the product. Also, you will find the scent will not last in your product because perfumes are diluted with alcohol. I hope this helps Georgia! Hi, I was planning to make this as a diy Christmas gift but I was wondering what does it do? Is it an all over scrub or solely for the hands? Also does coconut oil have a strong smell of coconut? I wanted to switch out the scents with different fragrances but I don’t want a coconut smell to go along with the other scents. Also what are good combinations of fragrances that you would recommend? I was thinking of using the relaxing fragrance oil with the baby rose fragrance oil in the scrub but I’m not sure weather or not the smell will smell good. Lastly can I switch the coconut oil to a coconut butter or shea butter? Will there be a drastic difference? Sorry, this may seem like a lot but I would really appreciate a reply. Thank You. This is a body scrub that will help exfoliate the skin on the hands and body leaving you with freshly scrubbed skin! The Coconut Oil scent isn’t actually that strong and can actually be covered up with whatever fragrance or essential oil that you chose to use. There are so many fragrance blends that you can go with and we suggest blending a small amount in a cup to see if you like how it turns out. I would like to make this scrub. I purchased everything that I need. I watched the tutorial. But I have no idea how much of all the different ingredients to use. Am I missing something? I am new to soap making (and scrub making). I am sure that there is a basic recipe out there, but I don’t know it:( Would you mind emailing me the exact amounts of everything in the scrub? Thank you. I really want to try this scrub but I would like to use pink grapefruit essential oil instead of a fragrance oil. Can I use it at the same rate of 8mL per batch? THANKS! To avoid separation altogether, if I wanted to make this more like an emolient scrub, could I just add some eWax? And at what percentage. This is definitely on my “to-do” list. An emulsifier isn’t going to keep the ingredients from separating in this particular recipe. The emulsifier is there to keep two ingredients that don’t like to mix together (like water and oil), mixed. In this scrub that are not two ingredients separating from each other, the oil is actually warming up and melting. But, what is great is that the temperatures are lowering because winter is coming and the oils shouldn’t separate. You can also adjust the recipe to help prevent this by going with up to 9 ounces of the Coconut Oil to the 1 ounce of Fractionated Coconut Oil. Labeling- would this be labeled like a lotion as far as oz or fl oz go? Oh forgot, I also added the additional 14oz of sea salt that came in the kit. I tried to triple this recipe. I got it all right except for the fragrances. I miscalculated and put way too much in. I used 18 oz of the coconut oil, 3oz of the fractionated coconut oil, 18oz of the pink sea salt and 2oz each of the island coconut and lime fragrances. After I realized that I’d really overdone the fragrances, I tried adding 16oz of mango butter that I had. It’s still not coming together right. I am so sorry to hear that you are having some frustration with this recipe. Because of the addition of the Mango Butter, this recipe isn’t going to have the same final consistency and feel as it normally would. If you are finding that it isn’t thickening up for you, I would suggest popping it in the fridge for a couple of hours to see if that helps! I am starting to try to make scrubs, but i was wondering if it is safe to use fragrence oils in a scrub. Thanks so much! I made the scrub and had no problem getting it to set up. However I put it and another new scrub I made in the bathroom & forgot about them for a day or so. Last night I went to grab the pink salt scrub and it was liquid, the house is AC’d but humidity has been pretty bad the last week. So I was thinking what about some bees wax to try to make it more solid at room temperature? I made just the one batch according to your recipe, so would you give me a range of bees wax if you think that might help? Hi. I live in the Caribbean where Coconut oil is not going to solidify unless it’s in an air conditioned room. Can I use Shea or any other type of butter instead? If you realize that you might have a bit of trouble with this recipe hardening up, you can actually adjust the amounts to help it out. I would suggest increasing the Coconut Oil up to 9 ounces to your 1 oz of Fractionated Coconut Oil. You can even put a fan on it while you are stirring it and use an ice bath to help bring the temperatures down. I tried a variation on your scrub and the ingredients for mine are as follows. I am sure this process would work with the frac coconut oil. I wonder if an ice bath would help those who are having problems with the scrub thickening? Something like that goat’s milk project where Anne-Marie froze the milk and then placed the container in an icy bath to keep the temperature down when she mixed in the lye? I have yet to try this recipe, though I have everything needed. That is a great idea! We haven’t tried out the ice bath, but if you do, let us know how it turns out for you, we’d love to hear your feedback. We can’t wait for you to make this recipe and try it out for yourself. Can Germaben be used instead of Optiphen or Phenonip? I would like to make this with sugar. Would I still use the same amount as the salt or would this vary? Thank! Unfortunately, the sugar would probably melt into the hotter oils and not works as well. If you want to make a sugar scrub, here are a couple of recipes that we just love. Have you tried putting it in the fridge yet? In really hot areas, the scrub won’t solidify until you do that =) Keep me posted! That’s why I think this must be easier to make in the cooler season and not the middle of summer. I made this scrub & had the same problem as Jeanne. I used all the same ingredients from brambleberry. One thing thou, my coconut oil was already in liquid form, so I didn’t melt it, would that make a difference? We are so excited that you tried this recipe out, it is actually one of my favorites! Do you live in a warmer area? We’ve found that it can be a little more tricky to get your recipe to harden up if that is the case, but it can be done. We would suggest lowering the amount of Fractionated Coconut Oil by about .2 – .3 ounces to see if that helps. You can also pop your scrub in the fridge once it has reached a slushy-type phase to help it start to solidify. I live in Orange county, CA, and it has been warm here. How can I save this batch? Should I make another, lessen the Fractionated Coconut Oil and mix them together? I made my first batch today and I too am having trouble getting the mixture to solidify. I mixed for about 1 1/2 hours and finally put it in the fridge for 4 minutes and kept stirring for another hour. Then I used the whip attachment to my stick blender to see is that would make any difference. It appeared to be solidifying then when I stopped mixing it turned a little clearer. I used Natures Oil Coconut Oil (76 degrees), the fractionated coconut oil, pink sea salt and the fragrances as suggested in the recipe. Any suggestions. Is there any way I can salvage it. Thanks for your help. To put this scrub in a colder room would mean to put it in the fridge since I live in Nevada and it is over 100 degrees outside! lol No room is cold here! 🙂 I will try adding more coconut oil as you suggested and I will try another batch using less of the fractionated coconut oil to see how that works. You’re great! Thanks! Ok. Here is what I did. I melted 3 oz of coconut oil and reheated the original batch to just warm. I then added the 3 oz of coconut oil to the original batch. I put a fan on it and when it got down to about 80 degrees I placed it on an ice bath. That did the trick and it thickened it up. I still had to stir for almost an hour but now I have 1 1/2 jars of salt scrub. Yeah! I hope this tip will help some of you who are having trouble getting it to thicken. So I ended up with 9oz of coconut oil to 1 oz of fractionated coconut oil. Do you think this product is easier to make in the other 3 seasons vs in the summer? With the coconut oil melting at 76 degrees is it hard to keep it solidified? Yes I have and it won’t solidify. I am so sorry to hear that you are having a bit of trouble with it solidifying. If you live in an area that is a bit warm, this recipe is going to be harder to make solidify. The best way we’ve found to help it out, is to get it in as slushy as a form you can and pop in the refrigerator for a few minutes if you are having problems with it not solidifying. What does this mean? Coconut oil melting at 76 degrees … how do u get it to with out it going over and what is the safe way of doing it? I bought the Coconut Oil from yall and in the video it looks like cut up Shea Butter but mine is in a pouch bag. How do I get out the amount i need with out ruining the rest? To melt your coconut oil, all you have to do is pop that bag into the microwave and heat on 30-second bursts. When it is fully liquid, you can add it to your bowl. oh, one more question: If it stays separated, can I still use it and just stir it up first? You will want to reheat it and stir until the mixture has started to thicken up and harden and turn an opaque color. The oils might not mix back up if you don’t reheat it. The recipe calls for ounces. This is a weight measurement, right? Can I add more salt? Should I add more coconut oil? What does the fractionated coconut oil do? I bought the supplies from Brambleberry. I am sorry to hear that you are having a little frustration with this recipe. Could you tell me a bit more about the ingredients that you used? You will want to make sure you are using both the Coconut Oil and the Fractionated Coconut Oil in this recipe as the Coconut Oil will help it harden up. You will have to stir the mixture until it hardens, and turns thick and opaque. Otherwise the salt will sink to the bottom and the oils can seperate out. All of the recipes on Soap Queen (including this one) are by weight unless otherwise specified. The Fractionated Coconut Oil actually helps to keep this scrub in more of a in-between state (not liquid, not hard). Without it, your Coconut Oil would harden up and you would have to remelt it every time you would want to use it. I am using the supplies listed on Bramble Berry to make the scrub. Is it possible I overheated the coconut oil? I’m fine stirring it before using. That’s no problem. I just wanted to double check before giving it to friends and family as gifts. How long did you stir it for? You will want to make sure that you stir until the mixture actually starts to thicken up and turns an opaque color. If you don’t do that, the salt can actually sink to the bottom and the oils can separate. Thank you Becky! I did add some more salt to salvage my product and it seemed to work. I think next time I make, I will do exactly as you suggest. Anita… I used 2lbs of salt and all other ingredients accordingly adjusted and made x8 4oz. jars. I overfilled with salt cause I had a separation problem. Again thank you Becky and Brambleberry/soap queen for all the recipes. How much does it make and how many jars will i need? Thank you Becky for answering! If I went over the preservative and used 4 grams (I rounded up since my gram scale does not have decimal point option) is that bad? I used all your products to make the scrub. Im wondering if I add more salt would it be more evenly distributed? Has anyone experienced this? I did do one thing different as I think about it… my oils took forever to solidify so I placed in freezer for 4 minutes ( I live in South Florida and its always so humid and hot even in air). Could that be the culprit? As soon as I took it out it melted down again.. any thoughts are very appreciated! The extra .3 grams shouldn’t affect your scrub, and I would actually suggest using some of our droppers for any of your recipes that require grams, they work really well for small amounts. It does sound like sticking your scrub in the freezer is actually what caused your coconut oil to separate. With this scrub, you won’t want to stick it in the freezer, just keep stirring until the Coconut Oil starts to solidify, I would suggest working in the coolest and dry room you have possible and storing the scrub in the same way! I made this delightful scrub and I have a couple of questions. My coconut oil has floated to the top and has hardened. Is there a way to avoid this? I followed the measurements exactly. My next question. I am new to soap making and decided to use the preservative Phenonip. I added 4 grams to the concoction. Would you tell me if I measured this correctly? Thank you so much soapers! Could you tell me a bit more about your process when you made this scrub? I’d love to hear it so I can help you troubleshoot what happened to your scrub. In this particular recipe, we did use our own Coconut Oil which has a melt point of 72 degrees, are you using a different type of Coconut Oil? With preservatives, you will always want to follow the suggested usage rate for the preservative you are using. Phenonip is 5 -1.0% of the total weight of your product. Going with the higher percentage (1%), that would be 3.7 grams of Phenonip in your scrub! i want to make this scrub. i am missing fractioned coconut oil can i use any other liquid oil? If you don’t have the Fractionated Coconut Oil you can also use another fixed oil like Sweet Almond,Jojoba, or Olive Oil. Andrea beat me to it! Is there a recommendation as to how much preservative to use? ok I didnt read it all and just seen this but i am confused. I am making the exact amount tat this recipe calls for and i am using the little ML droppers … so how much would i use. I love this scrub! So pretty and feels amazing! If this were to be made for sale, would you recommend adding a preservative? I only have germaben ll. would that work as a preservative in this? What would be the recommended amount of Phenonip, Optiphem Plus or Germaben II? I have all 3 of those and which would u prefer to use if our was making it?